any reported to the Commission in writing during the currency of the list. 6 Age limit : (18-37). Candidates born between 02.01.1976 and 01.01.1995 (both dates included) are eligible to apply for this post with usual age relaxation to SC/ST and OBC candidates. 1 Degree in Law of any recognized University. 2 Enrollment as an Advocate. 1) In the absence of qualified persons for appointment by transfer from any Category in Kerala Secretariat Subordinate Service, the vacancies earmarked for that category shall be filled up from qualified persons for appointment by transfer from any category in any department under the Govt. or in the service of the High Court of Kerala and vice-versa. If qualified persons are not available for appointment by transfer from the categories mentioned above, the vacancies earmarked for these categories shall be filled up by direct Recruitment. (Locomotor disability/Cerebral Palsy , Low vision) vide GO(MS)No.26/2011/SWD dated 03.03.2011 & GO(P)No.1/13/SJD dated 03.01.2013. 3 Probation : Every person appointed to this post shall from the date on which he/she joins duty be on probation for a total period of 2 years on duty within a continuous period of 3 years. 4 Test : Every person appointed to this post shall within the prescribed period of probation pass the Secretariat Manual Test. Qualification, experience , community, age etc. have to be produced as and when called for. 9. Last date for receipt of applications :- 19.06.2013 Wednesday up to 12 midnight. I Paper – Code of Civil Procedure and Civil Rules of Practice. II Paper – Code of Criminal Procedure, 1973 (Central Act 2 of 1974) and Criminal Rules of Practice. I Paper –The Kerala Stamp Act, 1959. II Paper – The Indian Limitation Act, 1963. The Kerala High Courts Act, 1959 and the Small Cause Courts Act (Act VII of 1957). Time and marks: - Each paper will be of three hours duration. The total marks for each paper is 100 and the minimum required for a pass is 40. 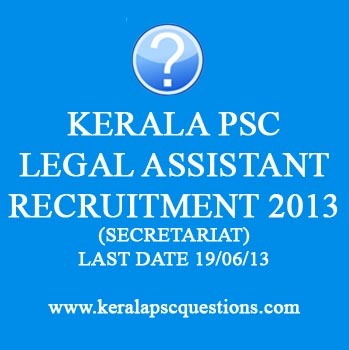 Where can I get a previous question paper of the legal assistant exam?